Want extra bounce in your step? The NordicTrack Apex 4500 treadmill is a new design that offers all the right features, from iFIT® workout compatibility to cool programming, but the thing that sets it apart is the reflex cushioning on the deck. If you have had experience walking on a number of different treadmills, it’s likely you have never felt the “bounce” of anything like this before. The NordicTrack Apex 4500 features a 7x30 ClearView™ display where you can track your speed, distance, pace, time, pulse, calories burned and even carbs burned. The treadmill comes with a big 12% incline, 1-Touch controls for speed and incline, a Training Zone indicator, MyMiles™ tracker, and 12 programs that will help you focus on aerobic, weight-loss, or performance goals training. UPDATE: The Apex 4500 model has been discontinued and replaced with all new upgraded models. For a comparable machine check out the newest NordicTrack treadmills here. The shorter walking area (55") and small motor on this model are its main drawbacks. Trainers would recommend getting a machine with at least a 3.0 CHP motor if you’re looking at treadmills in this price range. Still, the NordicTrack Apex 4500 treadmill has a lot of pluses: it comes with 2.5" sealed rollers to give the machine a quiet ride, the cushioning is first rate, and the overall quality is above average. 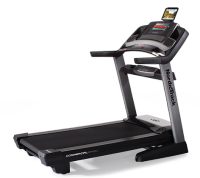 It has so many good qualities designed into it that experts wonder why NordicTrack chose to hold down the price on the Apex 4500 by installing a weak treadmill motor. If you’re a walker or light jogger, and don’t weigh over 250 pounds, then the 2.25 CHP motor will be adequate for your needs. The reflex cushioned deck is an innovative new design that some users have found to be too springy. You can visually see that the deck is arc-shaped and it responds to your foot strikes by first flattening to absorb the impact, then springing back up to the arc shape. Some treadmill reviewers say they loved it while others hated it. Because it feels so different from other types of decks, you may want to locate an Apex 4500 locally and try it out first before you buy. 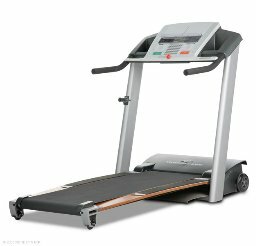 If you’re looking to buy a more traditional NordicTrack treadmill, this isn’t the one. There are up to 20 current and recently discontinued NordicTrack models on the market and it can be hard to compare them all and find the right treadmill at the right price. The NordicTrack Apex 4500 has been offered online ranging in price anywhere from $999 to $1999, but we wouldn’t pick this model over one of its siblings, and not just because of the springy deck. It offers good quality and value, but for our money we would opt for the Elite 7500 or the NordicTrack Elite zi -- both offer stronger motors. We would also recommend you compare the NordicTrack Apex 4500 treadmill with the high value NordicTrack Elite XT which also comes with a bigger motor, as well as adjustable cushioning, a 60" belt, 26 programs, and a built-in TV on the console.